Who else here is totally in love with The Container Store? I definitely am, since it makes organizing my entire home SO MUCH easier! In fact, Hubby and I just ordered one of their ELFA units (huge sale going through February 11th!) so we can tackled the kids’ terribly messy loft playroom! I can’t wait to share that with y’all….but in the meantime, I’ll share this totally fabulous giveaway for $100 to The Container Store! 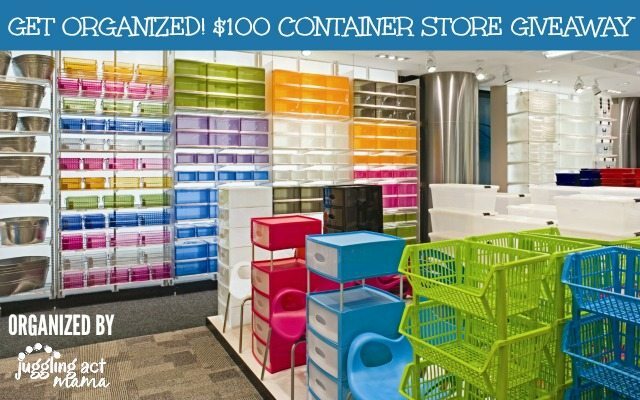 Welcome to the New Years Container Store Giveaway! If you’ve never been to The Container Store, you’re totally missing out. First time I ever went, I was a bit like ‘woooooow’ and we spent a couple hours just browsing all the stuff! They have things to help you organize any room…from the garage, to tiny closets, to bedrooms and offices. Seriously, even travel organization! Yup, they’re awesome….I can’t wait for my next organization project with them! To enter, use the widget below. Only one entry is required. Additional entries increase your odds of winning. Terms and Conditions: Open to US Residents only. 1 winner will be chosen. Prize must be claimed within 48 hours of announcement or a new winner will be drawn. Prize is not redeemable for cash. All entries will be verified. This giveaway is in no way associated with Facebook, Pinterest, Twitter, Instagram, Rafflecopter, the Container Store or any other entity unless otherwise specified. If you’re a blogger and would like to participate in future events with Juggling Act Mama like this one, please sign up for email notifications here. « Join the Love Letter of the Month Club! Ya, that’d be perfect, Tonya!